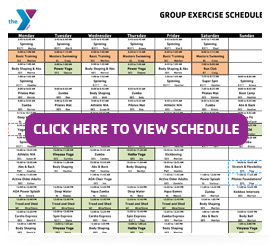 The Y offers over 100 group exercise classes every week, at various times, to accommodate your schedule. Look below to see the many ways group exercise can support you. All group exercise classes are free for members. View the Group Exercise Facebook Group. Les Mills BODYPUMP is now part of our group exercise offerings and it’s FREE! Classes will be offered at various times and days, so you can be sure there’s a convenient option for you! Your membership gives you exclusive access to 100 free exercise classes per week. Look below to check out the ways the Y can keep help you stay active, for free. AOA: Active Older Adults (Ages 50+) is a combination of chair & standing exercises designed to improve muscular strength and flexibility to help active older adults continue activities of daily living with ease. Small hand weights may be used as tools to increase strength. AOA Chair Yoga features seated yoga exercises and relaxation techniques. Belly Dancing is designed to get you off your feet and onto the dance floor. In this class develop strength, flexibility, and grace as a dancer through isolations, drills, and choreography guaranteed to make you sweat. Appropriate for all levels. Body Ball is one of the best tools you can use to improve balance and strengthen your core. Come and learn how the stability ball can be used for strength training, flexibility, and balance. This class may also feature strength training. Body Shaping improves muscle tone while strengthening and defining the entire body. This class uses a combination of free weights, bands, balls and body weight resistance training. BodyPumpTM is based on THE REP EFFECT, which is a proven formula that exhausts muscles using light weights, while performing high repetitions to develop lean, athletic muscle. It’s a workout that challenges all your major muscle groups, builds strength and tones your entire body! Boot Camp includes skills, drills, circuits, and intervals. This class will push you beyond your current fitness level and give you the extra challenge you may need to boost your exercise program. This class combines cardio, agility, strength, and endurance. Cardio Express uses step, hi/lo aerobics, kickboxing, and athletic drills for a good, old-fashioned sweat. This class is appropriate for all fitness levels. Core Values is designed to strengthen the core. The core muscles support and surround the spine from the front, side, and back. This class targets the abdominal muscles and the lower back. This class may use traditional or non-traditional exercises. Cycling/Cycling Express is an exhilarating cycling experience that will torch hundreds of calories and improve cardiovascular strength. Good for your body, your heart, and your love for the ride. Express class is 40 minutes. Super Cycling Saddle up! An hour and half ride covering several hills at a steady cadence made to drastically increase your endurance, blood flow, and riding strength. Functional Movement is a strength training class designed to provide cardio benefit as well as designed to prevent injury and improve biomechanics, balance, stability, strength, reaction time, and sports performance. Interval Training is one of the best ways to burn fat and calories! This class features short sets of higher intensity activity. This class can include cardio and weight intervals or intervals of all cardio. Kickboxing uses basic boxing techniques and footwork to create an intense, dynamic cardiovascular workout. This class increases upper body strength, agility, flexibility and endurance while building self-confidence. Kickbox Intervals alternates between kickboxing and strength-training segments. Nia / Athletic Nia is a cardio class full of fun, great music, and movement. Nia is a healthy, exuberant movement that benefits the body, mind & spirit by combining techniques from the martial arts including tai chi & yoga. Whether you’re a fit athlete or a beginner, ages 9 to 90, Nia will challenge you while respecting your needs. Athletic Nia incorporates added aerobic intensities. Pilates Fusion is based on traditional Pilates exercises and incorporates athletic training moves to provide a workout that will improve core strength, balance and flexibility. Pilates Mat is designed to strengthen the core of the body by developing pelvic stability & abdominal control. It is an excellent way to increase muscular endurance, improve flexibility, & encompass the spirit, mind & body into one effective workout. PopFit Scorch calories in this wildly fun dance fitness class set to rock, pop, and hip hop music. Easy to follow and you can sing along! T’ai Chi Chih is a moving meditation. 20 easy to learn movements, when practiced regularly, will improve your balance and flexibility, increase bone health, and enhance the function of the immune system. Tread and Shed lets you experience the benefits of a cardiovascular workout using the treadmill. This instructor-led class will incorporate sprints and hills to increase your endurance and help you understand your rate of exertion. Treadmill Coaching – A low or high impact cardio class designed to improve cardiovascular fitness, strengthen legs and core while providing technical instruction on treadmill use, walking, jogging, and running. Led by a certified running coach. Turbo Kick Get hooked on the Turbo high! With cardio kickboxing and body-sculpting dance moves choreographed to the hottest music mixes, you’ll get lean and toned—and have a blast doing it! It’s high intensity, fast-paced, and totally addicting! Yoga is an ancient practice that helps create a sense of union in body, mind, and spirit. The physical postures, breathing exercises and meditation practices of yoga have been proven to reduce stress, lower blood pressure, and regulate heartbeat. Participants leave feeling more relaxed, while increasing flexibility and creating harmony of the mind and body. Classes are open to all levels. Gentle Yoga Stretches & Meditation The exercises in this class are slow moving and recommended for people with injuries, severe stiffness, or those who wish to approach yoga exercises gradually. Props such as balls and yoga mats may be used. This class ends with meditation. Hatha Yoga integrates the postures, breathing exercises, relaxation and meditation to harmonize you on every level – body, mind, and spirit. It is a mindful and moving class, where all levels are welcome. Power Yoga is a more challenging yoga practice where the focus is on building muscular and core strength as well as flexibility. Vinyassa Yoga – Vinyassa means “breath-synchronized movement”. In a Vinyassa class, poses flow from one to another in conjunction with the breath. Zumba & Zumba Express is a fusion of Latin and international music – dance themes creating a dynamic, exciting, effective fitness system! The routines feature aerobic/fitness interval training with a combination of fast and slow rhythms that tone and sculpt the body. Zumba utilizes the principals of interval training to maximize caloric output, fat burning and total body toning. It is a mixture of body sculpting movements with easy to follow dance steps. Classic Zumba is “old school Zumba. Enjoy the songs and dances that put Zumba on the map, with less jumping, hip hop but the same amount of fun and chances to learn some new dance moves! This class is perfect for the participants who want to dance but not stress their joints. Zumba Kids is group exercise for everyone! Bring your kids and exercise as a family. Water exercise increases flexibility, muscular strength, and endurance without stressing your joints. These classes incorporate cardiovascular, strength training, and stretching for a total body workout! Water classes are appropriate for all ages. Class sizes for water exercise is limited to 18 people to maintain a safe lifeguard/participant ratio. AOA Power Splash & Deep Water (for ages 55+) is a water exercise classes designed for Active Older Adults. Build muscle strength, cardiovascular endurance and flexibility while enjoying the warm water pool. Power Splash is performed in the shallow water. Aqua Fit combines the benefits of both Deep Water and Power Splash classes. Aqua Games is a less structured format with fun and games in the pool. This class is for adults only. Aqua Zumba is low-impact Latin dance performed in the water. Deep Water takes place in the deep end with the aid of buoyancy equipment. Men and women of all fitness levels are encouraged to participate.